Everyone must know the KaBar story already, since it’s only one of the most famous knives ever made in America, but here it is again: in the late 1800′s a customer of the Tidioute Cutlery Company of Pennsylvania wrote a letter of appreciation in regards to the Bowie knife he had recently purchased. Although the man’s handwriting was barely legible and the letter had seen hard times, company employees were able to make out that the happy trapper had used the knife to k*** a b*ar that had tried to kill him. 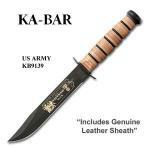 The trademark name Kabar saw first use in the 1920′s, but became truly famous when the parent company won the contract for the standard issue Marine Corps military knife of WWII. 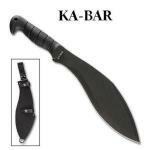 Today Kabar still produces tactical knives, but sporting and work knives make up a large part of the product line. Thirty eight immigrant cutlers who had learned their trade in the industrial center of Sheffield, England, settled together in one area of what is now New York and Pennsylvania, late in the 1800′s. The limited partnership they formed took the official name Tidioute Cutlery Company. By 1900 the company failed, but Wallace Brown bought the company’s physical assets and went into business as the Union Razor Company. As the company’s products increased in variety, the name changed to Union Cutlery. 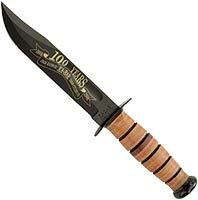 Union Cutlery’s tactical knife design developed for the U.S. military included the trademark stamp, Ka-bar, on the blade. Servicemen during WWII quickly associated the brand with quality and reliability, and by 1952 Union Cutlery submitted to public opinion and changed its name to Ka-Bar. Ka-Bar’s history hasn’t been all success, including a bankruptcy which forced a sale to Robinson Knife Company and then to Cole National Corporation. 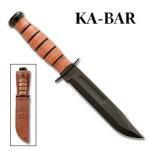 When Cole also failed, Ka-bar sold to Alcas Corporation of Olean, N.Y., the company’s current home. 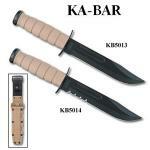 Ka-Bar’s produces its most famous knife, the Ka-Bar USMC Fighting/Utility knife, in exactly the same style as the WWII knife, plus several other variations using the same basic pattern but newer materials like molded Kraton handles. The knife’s “do-anything” pattern makes it popular as a sporting or survival knife as well as military sidearm, strong enough to cut through a steel drum or hammer nails, and still able to neatly field dress a deer. 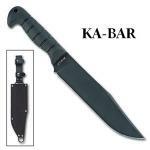 Ka-Bar also makes fixed blade and folding hunting and fishing knives with a much less military look, as well as modern tactical folders featuring rugged lockbacks and one-handed opening. Ka-Bar acquired the assets and designs of Becker Knife & Tool and produces many popular Becker designs like the Becker Necker and the Becker Tac-tool. Designed by Bob Dozier, marketed by Ka-Bar, and manufactured in Taiwan, the Bobcat Dozier from Ka-Bar looks much like Dozier's larger fixed blade designs when open and locked. The Bobcat offers similar grip strength and versatility in a folding lockback build with qualities tactical users and woodsmen both appreciate. One of three Adventure series knives released by Ka-Bar in 2010, the Ka-Bar Adventure Baconmaker satisfies anybody who likes a knife with great style but treats their tools a little rough. This pigsticker can take it. This Extreme Fighting Knife from Ka-Bar works some important improvements into the classic Ka-Bar Marine Corps fighting knife design. If you liked that one, you'll love this one too. Designed as an LDK or Last Ditch Knife for police, the TDI knife Rig from Ka-Bar comes in two sizes with two slightly different mounting assemblies. 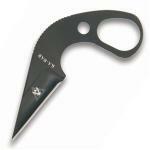 The larger knife is for belt wear, and the smaller rig straps discreetly to the ankle. 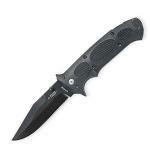 Obviously I'm in favor of carrying knives, but not only for self defense. We all constantly run into circumstances that require tools. 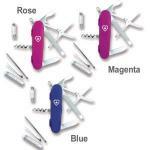 Knives are among the first implements that humans invented. Leaving your knife behind is like leaving your teeth behind. This classic fighting knife from Ka-Bar, first manufactured at the onset of WWII, has survived more than fifty years of industry changes unscathed. Look around you for other items with that longevity and you'll find only a few. 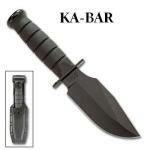 Hammers, wrenches, and Ka-Bar knives head the list. So, is this really the "next generation" of fighting knives? There's no doubt that it looks pretty intimidating. The next generation might be talking about how scary this one looks. Ka-Bar knife company, originally known as Union Cutlery Company, has been making a variant of this knife for over one hundred years.